Digital Society Foundation lodged this Regional Initiative submission to the Pacific Islands Forum Regional Consultation Program. Many Pacific communities face a daunting challenge to navigate their way to a sustainable and prosperous future as the world advances rapidly into the digital age of human development. 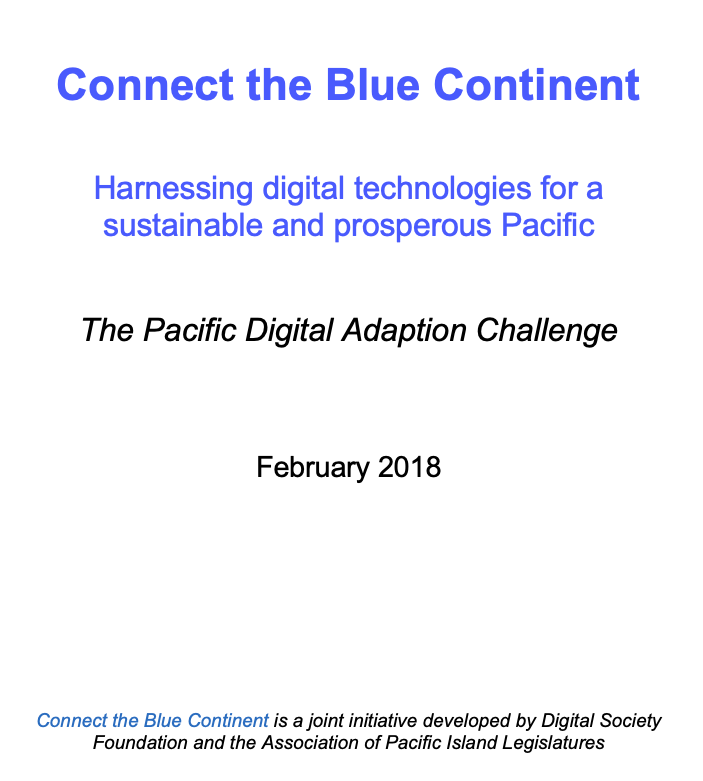 Our submission deems this the ‘Pacific Digital Adaption Challenge’. Individual communities and nations cannot tackle this challenge alone. The complexities and inter-dependencies across all facets of our modern, global socio-economic system demand a co-operative approach to harnessing digital technologies and innovation. This is especially relevant to developing and disadvantaged Pacific communities who operate in significantly different social and economic contexts to other regions. Mechanisms for stimulating and supporting this co-operative approach are a regional imperative. The opportunity is to lift social and economic conditions across the region far more rapidly, effectively, inclusively and in balance with our cultural and environmental responsibilities. Digital Society Foundation is proud to be a member of the Alliance for Affordable Internet (A4AI – www.a4ai.org), which recently released its 2017 Affordability Report. Why have we joined? Right now, just one in three people in the developing world are online – with cost being the key barrier. In developed nations, broadband Internet costs 1-2% of monthly per capita income — less than a daily coffee. In less developed countries, however, this figure skyrockets to over 30% for a fixed line and to between 11% and 25% for a basic mobile broadband package (depending on options chosen). A4AI’s goal? Meeting the UN’s target of broadband prices at less than 5% of monthly incomes to allow millions more to access the life changing potential of the Internet. The Alliance and its members believe that policy and regulatory change can drive prices down fast, and so all members have endorsed a set of policy and regulatory best practices designed to create the conditions for open, competitive and innovative broadband markets. Since its launch a year ago, the Alliance has signed deals with four countries, and is working on the ground to build local coalitions that can conceive and deliver solutions tailored to local realities. To find out more about the Alliance’s work, check out the 2016 infographic below, visit the Alliance’s website or follow them on Twitter. Digital Society Foundation’s first initiative, Connect the Blue Continent, has been launched online. The initiative has been developed in conjunction with the Association of Pacific Island Legislatures. The aim of the online facilities are to raise awareness about the digital divide challenges facing Pacific Island communities as we enter the digital age of human development. Please visit us at http://www.connect-the-blue-continent.net to learn more about the connection between affordable broadband and development issues such as food security, health and well-being etc. 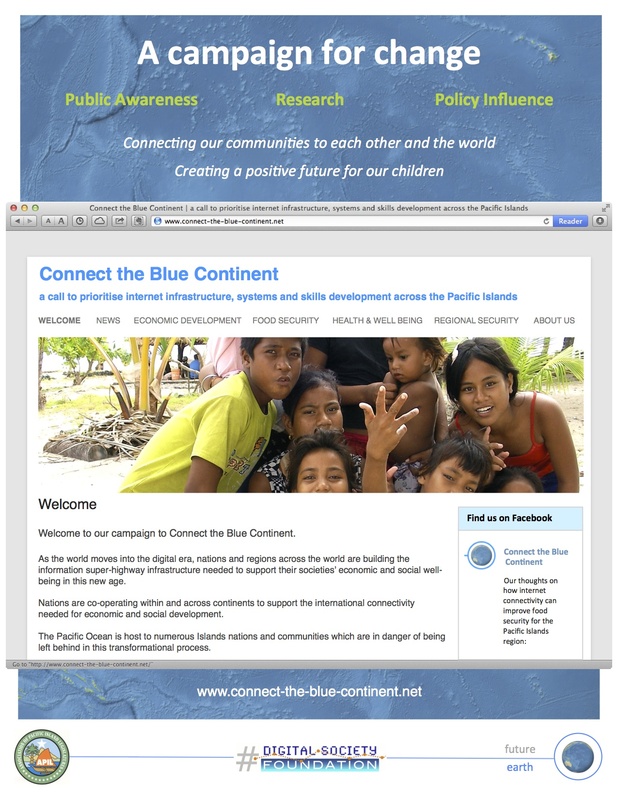 We have also launched a Facebook presence for Connect the Blue Continent here: http://www.facebook.com/BlueContinent – please support us by ‘like’ing our page.